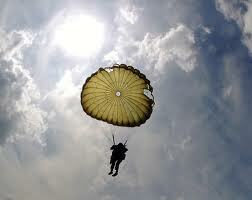 Home » parachute » Has Evidence-Based Medicine Gone Too Far? Although there is no question that evidence-based medicine is a very important development in the evolution towards higher quality healthcare, the demand for evidence for a given treatment can go too far. The following abstract is an ACTUAL published article in the British Medical Journal describing the lack of evidence that parachutes are effective when falling out of a plane. Parachute use to prevent death and major trauma related to gravitational challenge: systematic review of randomised controlled trials.Smith GC, Pell JP (2003) BMJ. 327 (7429), 1459-61. Main outcome measure: Death or major trauma, defined as an injury severity score > 15.